Michelle Hedley (33): Lingard Street, Leigh - Failed without reasonable excuse to comply with the requirements of a community order given for harassment of Lee Lewis: New community order made with rehabilitation activity requirement. Luke John Paul Smith (28): Bag Lane, Atherton - Failed without reasonable excuse to comply with a community requirement of a suspended sentence order given for a catalogue of shoplifting offences from Sainsbury’s in Leigh, theft from Tesco, Lloyds Pharmacy and B&M Bargains: Jailed for 38 weeks. Michael Derek McPike (36): Birkdale Avenue, Hag Fold, Atherton - Attended at an address at Hatton Avenue and spoke to Emma McPike, and sent her flowers, while prohibited from doing so by a non-molestation order: Jailed for six weeks, pay a surcharge to fund victims services of £115. Robert Hilton (21): Brecon Close, Platt Bridge - Breach of the peace in Wigan: Bound over in the sum of £75 for 12 months to keep the peace. Joshua Lymn Powell Hughes (28): Heath Street, Golborne - Breach of the peace in Leigh: Bound over in the sum of £100 for 12 months. Neil Christopher Masters (33): c/o Housing Options, Platt Bridge - Assaulted paramedic Derek Rowlands by beating, damaged glasses to the value of £70 belonging to Derek Rowlands: Jailed for 18 weeks, pay compensation of £250. Ashley Dolman (31): Grasmere Drive, Ashton - Failed to give information relating to the identity of a driver alleged to have been guilty of an offence: Fined £300, pay a surcharge to fund victims services of £30, pay costs of £150 to the Crown Prosecution Service, driving record endorsed with six penalty points. Neil Gregory Doran (45): Hunters Chase, Billinge - Being in charge of a motor vehicle while over the drink-drive limit, with 43 micorgrammes of alcohol in 100 millilitres of breath, with the legal limit being 35 microgrammes: Fined £485, pay a surcharge to fund victim services of £48, pay costs of £85, driving record endorsed with 10 penalty points. Andrew Roy Hilton (34): Sumner Street, Atherton - Drink driving on Gloucester Street, Wigan, with 108 microgrammes of alcohol in 100 millilitres of breath, with the legal limit being 35 microgrammes: Community order for 12 months with alcohol treatment requirement and 12-week curfew, pay a surcharge to fund victims services of £85, pay costs of £85 to the Crown Prosecution Service, disqualified from driving for 28 months. 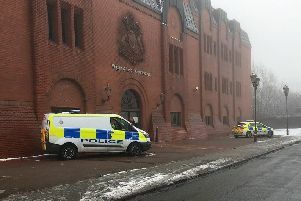 Karl Dwyer (28): Alpine Drive, Leigh - Drove on Kirkland Street in a large goods vehicle or passenger carrying vehicle without insurance: Fined £250, pay a surcharge to fund victims services of £30, pay costs of £100 to the Crown Prosecution Service, disqualified from driving for six months. Stefan Jonathan Hart (22): Rugby Road, Leigh - Caused Bethany Shovelton to fear that violence would be used against her: Jailed for 18 weeks, restraining order not to contact Bethany Shovelton, pay a surcharge to fund victim services of £115. Aiden George Maynes (29): Marlborough Road, Atherton - Drove at a speed over 40mph in a speed restricted area: Fined £60, pay a surcharge to fund victims services of £30, pay costs of £85 to the Crown Prosecution Service, driving record endorsed with three penalty points. Zachery Cartwright (24): Wigan Road, Leigh - Failed without reasonable excuse to comply with the community requirement of a suspended sentence order: Fined £500. Mark Joynt (44): Dickens Place, Wigan - Used threatening or abusive words or behaviour within the sight of someone likely to be caused harassment, alarm or distress: Fined £120, pay a surcharge to fund victims services of £30, pay costs of £85 to the Crown Prosecution Service.